Click arrows to see information about other land use applications. Pursuant to County Development Regulations, notice is hereby given that Pend Oreille County did on December 29, 2017 received a complete Shoreline Substantial Development Permit Application, Joint Aquatic Resources Permit Application, and associated documents from Pend Oreille County Public Works Dept. and did on December 29, 2017 issue a Determination of Completeness for Resurfacing Fertile Valley Road Project (FILE NO. SSDP-18-001), Location: Fertile Valley Road @ HWY 211 to the Outlet Bridge. An Environmental Checklist under the State Environmental Policy Act (SEPA) was prepared by the applicant on October 3, 2017 and the county expects to issue a Determination of Non-Significance for this project. The optional DNS process is being used and this may be the only opportunity to comment on the environmental impacts for the proposal. Any person desiring to express their views, or to be notified of the action taken on this application should contact the Pend Oreille County Community Development Department. The submitted application and related file documents may be examined by the public between 8:00 AM & 4:30 PM at the Pend Oreille County Courthouse, Annex Building, 418 South Scott Street, Newport, WA 99156, (509) 447-4821 and viewed at www.pendoreilleco.org. Contact: Andy Huddleston, Community Development Department Planner, (509) 447-6462, ahuddleston@pendoreille.org. Written comments from the public may be submitted to Pend Oreille County no later than February 8, 2018. 3/20/18 Public Hearing AgendaPend Oreille County is proposing to change the Development Regulations with regard to the processing requirements for various Land Use Applications including Conditional Use Permits and Variances to name a few. How do I Show Support or Opposition to a Project? Contact the Community Development Department to let us know your concerns or support for your project. Local knowledge is key to determining outcomes of projects because of information that this department or others may not be aware of. Written letters or email sent to us during comment periods will be official public record. The Planning Commission is a group of 9 appointed volunteers (3 from each district) who are charged with many important current and long range planning functions. They meet on the second Tuesday of every month at 6 PM, and meetings are open to the public and are held at the Cusick Community Center. To get any more information on the next scheduled meeting contact the Community Development Department. Who are the Planning Commissioners? 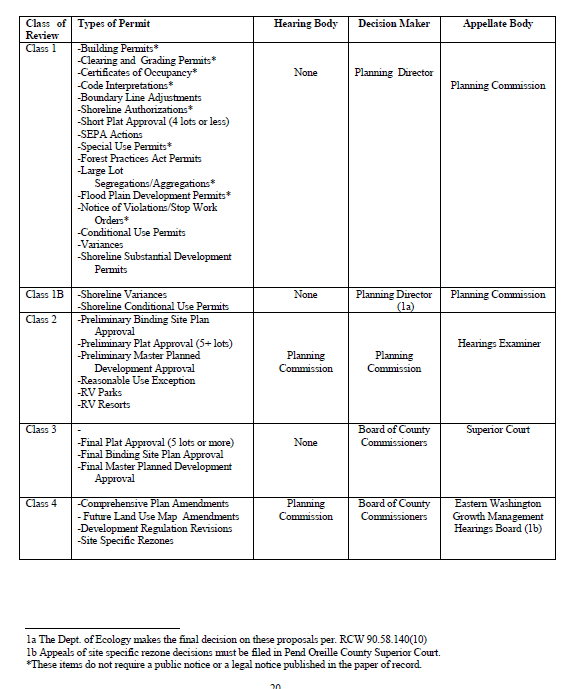 When should I go to a Commission meeting? 1. Certain projects are heard and decided by the Planning Commission rather than the Community Development Department. Examples include long plat subdivisions, RV resorts, and County Planning. If you are attempting to receive a class 2 or class 4 permit, your application will be reviewed by the Planning Commission. 2. Interested parties will come to ask questions, express concern, and show approval or disapproval of projects being reviewed by the Planning Commission. 3. The Planning Commission is the appellate body for the decisions of the Community Development. If you do not agree with a decision made by the Community Development Department you may ask to have your application reviewed by the Planning Commission. Agendas are usually released one week before the meeting.